The truth is I don’t get out of the house a lot. My son Max is in half day kindergarten, and Sadie, my 2 year old, naps pretty much the whole time he is at school. Which is great because, it allows me a couple of hours of alone time everyday. But it does mean, I am house bound unless I want to haul both kiddos around on errands. I am rarely feeling that brave. We will sometimes venture out to Target, or the grocery store for quick trips. Often we venture to the park and drive through Starbucks, but I am definitely not taking them thrift store hunting with me! So what is a girl with a love of quirky vintage home accessories to do? ETSY! One of my favorite things to do during nap time is browse Etsy’s vintage category. My absolute favorite trick is to just search a color like “yellow” or something vague like “letter m” and just spend some time clicking around. There are a few items at premium pricing, but there are so many reasonably priced finds that would take me years to accumulate. 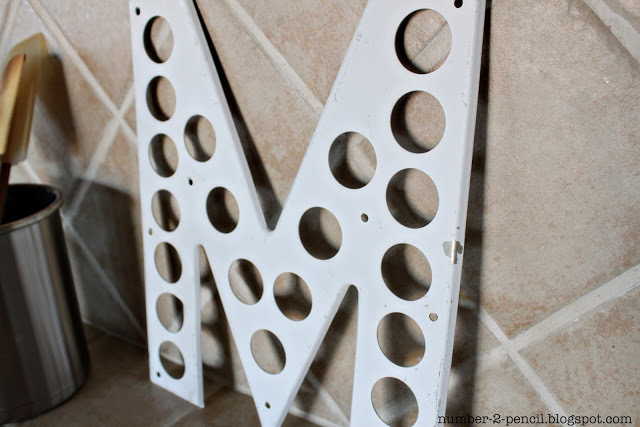 I love the thrill of the hunt, but I also love finding the perfect funky piece, like this fabulous “M” salvaged from a vintage freeway sign. And at around $15, the price was right for me! How cool is this? 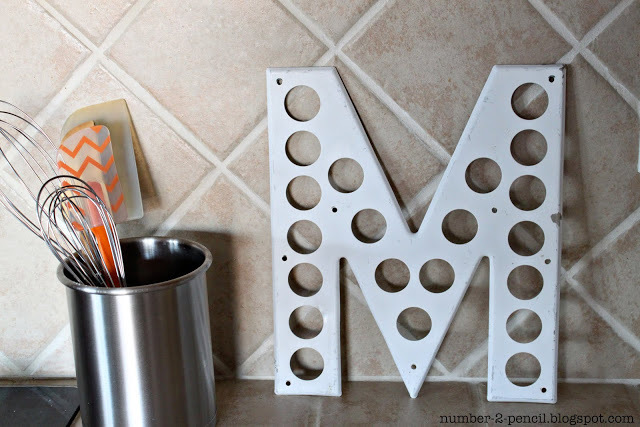 I just snapped a couple of quick pics of where it actually resides in my home, right next to the stove. I figure if it can weather freeway traffic and debris, it can weather my tomato sauce splatters and hot oil splashes. We are pretty ingenious us mums aren’t we?!! An awesome way to still get your vintage fix…be a bit like Christmas when the parcel arrives!! You’re too fast for me! I have to blog in small increments in between taking care of kiddos… but I really do like your blog and am honored to recognize you with the Liebster Award! A girl after my own vintage loving heart! Ah, I remember the days when my twins were little – very hard to get out and leisurely browse the aisles! What’s a girl to do – you nailed it. Love Etsy and that M is fabulous! New follower. I’m addicted to Amazon Prime and Diapers.com, that way I don’t have to leave my house with three kids in tow.